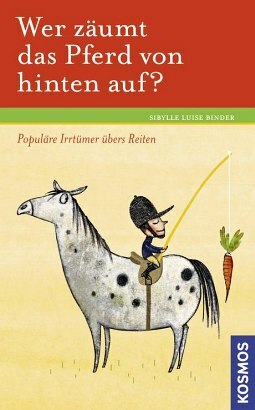 Product information "Wer zäumt das Pferd von hinten auf?" What’s behind the legends about horses? „Riding is no sport. Only the horse moves, doesn’t it? Particularly, since riding is only affordable for rich people.“ Or „Dressage is unnatural and horses don’t jump of their own accord, right?“ No matter whether non-riders or horse lovers, such prejudices and misconceptions occur everywhere stable air wafts. What is behind these and other „myths“ about riding, Sibylle Luise Binder explains with a lot of wit and expert knowledge. In the chapter „misconceptions for the advanced“, even experienced riders and aficionados can learn something.